- Cold air intake system. - Optima yellow top battery. - RV6 Performance Catless Downpipe. - Mugen style rain guards. 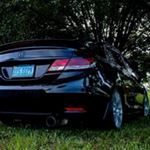 - Hydro-dipped front & rear "Honda" emblems. - De-chromed front bumper (painted black). - De-chromed front grille (painted black). - De-chromed rear trunk lid (painted Black). - Black Vinyl wrap midway on tail lights. - Bayson R front lip. - Hydro-dipped dash & radio trim pieces. - Weather Tech floor mats. - Strut King Brake & Accelerator Pedals. - Blue billet battery tie down. - Blue billet oil cap. - Blue Billet Mugen style radiator cap. - Hydro dipped radiator cover. - Hydro dipped battery cover. - Hydro dipped fuse panel cover. - Hydro dipped ECU cover. - Blue lighted "Civic" door sills. - Blue LEDs strips to light up engine bay. - Xenon HID headlights, 10000k. - OEM fog lights installed. - Xenon HID fog lights, 10000k. 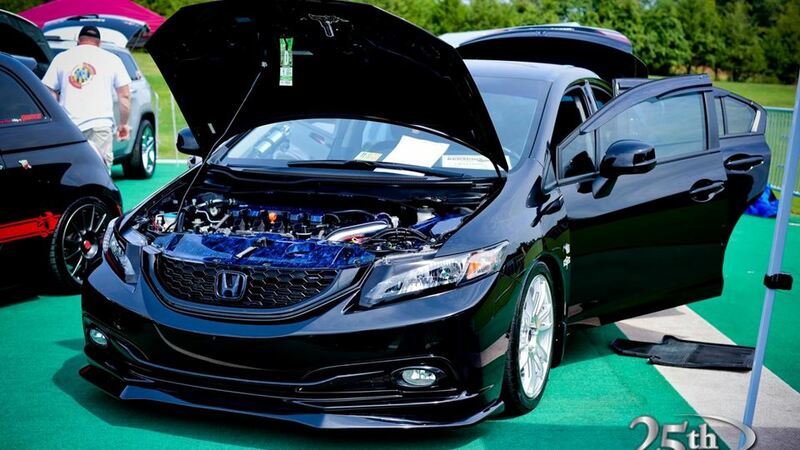 - Civic/Integra side marker lights with hyper white LED's. - Hyper white LED reverse lights. - Hyper white LED tag lights. - iPad mini custom installed, hydro-dipped. - Phoenix Gold Ti series component front speakers. - Phoenix Gold Ti series Rear speakers. - Custom trunk box hydro-dipped. - 2, 12" Pheonix Gold Ti series Subs. - Phoenix Gold Ti series 800watt mono block amp. - Phoenix Gold Ti series 1000watt x4. channel amp. - Viper alarm with smart start. - SiriMoto Phase 2 Strut Bar. - D2 Racing lowering springs with 2" drop front & rear. - Konig Torch Rims with Bridgestone Potenza Tires 205 40 17. (summer wheels). - 18" Motegi Tougue Rims with Continental 215 40 18 tires (winter wheels). Twizted Intentions Cruise to Cancun Cantina!! Just a few friends hangin out takin' pics!! Cuise to Ambitious Whips Krispy Kreme car meet. Nothing like having a car show on the Redskins practice field. .
Getting Custom Magnaflow exhaust and RV6 Catless downpipe installed!! Here is a little exhaust clip, requested by another Drivn member!! 2nd Annual Fight Against Autism Show! !